After fighting with the 9th Battalion of the Highland Light Infantry during the First World War, Archibald C Dawson, 1892 – 1938, returned to Scotland where he became one of the most respected sculptors of the 20th century. The University chapel, designed by Sir John Burnet, has choir stalls sculpted by Dawson. The figures include Angels, Saints, Wildflowers and tiny animals. There is a figure of St. Mungo under the Great East Window and there are angels holding up the ceiling. The building at 200 St. Vincent Street in Glasgow city centre is another of Burnet’s major works and it has more of Dawson’s carvings. It shows St. Andrew standing proudly on the prow of a ship and was at one time the offices of a marine insurance company. It currently houses the Royal and Sun Alliance Insurance Group. The bronze statue above the door of the Russell Institute, on the corner of Causeyside Street and New Street, in Paisley, depicts young motherhood. This is also the work of Dawson and it was modelled by his own wife and family. He created a gigantic statue of St. Andrew as a youth, for the Empire Exhibition in 1938 in Bellahouston Park. It was situated in the Scottish Pavilion but unfortunately this piece was destroyed. The exhibition was opened by King George and sadly this was to be among some of Dawsons last work as that was the year of his untimely death. Dawson was known to have a sense of humour that appeared in some of his work. For example, a winged cherub on one of the buildings that formed part of the Glasgow cross extension, is seen to be climbing higher to get a better view. In doing this he is also seen to be baring his bottom to all who enter. On one Ayrshire country mansion, there is a series of wild creatures carved on corbels around the house, and one shows a small bird singing happily while the hunter, bow and arrow at the ready, looks in the wrong direction. But what has all this to do with Hillington Park ? In 2006, The Rev. John MacGregor, was visited by Ray McKenzie, Senior Lecturer at The Glasgow School of Art. Mr McKenzie relayed an amazing account of the furniture that adorns the chancel in Hillington Park Church, and that the pulpit, communion table and chairs, lectern, baptismal font and the prayer desk are all creations of Archibald Dawson. Mr. MacGregor said that this discovery for Mr McKenzie was almost like discovering the Holy Grail because, in Mr McKenzie’s opinion, Archibald Dawson was the finest wood sculptor ever to come from Scotland. For our centenary, I decided to research the story, and so between first hand knowledge of some of our members, Mr McKenzie and also information available on the internet I was able to trace the route of the furniture. In 1936 Archibald Dawson was commissioned to design the furniture as part of an improvement scheme for Newark Parish Church in Port Glasgow. As well as the furniture there were also 2 plaques depicting shipping scenes as the project was part funded by Sir James Lithgow, shipbuilder. The furniture he designed was in his inimitable style. There were the usual small animals, flowers and crops, children and adults. Each carving represents something different. On the lectern there is a small boy caught in the branches of a tree. The tree depicts the tree of life and the branches reaching up are holding up the book of life. 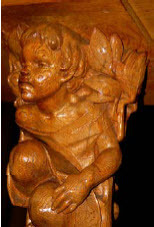 He also has a robin on his shoulder, which Dawson explained, ’not only do I like robins but they represent the Crucifixion, and there is no life without The Crucifixion.’ The small boy was based on his own son whom he called Benjy, although this must have been a nick name as his sons were called Alistair and Hamish. On the pulpit there are three panels each with different carvings representing different things. On one panel there is a farmer sowing seed and one hand is out of proportion,being twice the size of a normal hand. This represents the Hand of God throwing great handfuls of seed into His world showing, in Dawson’s opinion, what preaching was meant to be, that is spreading Gods word. The communion table has three designs. The crown of thorns and chalice, a passion flower and Madonna lily. On the crown of thorns and chalice there is carved the words ‘THIS DO IN REMEMBRANCE OF ME’ This seems to be a grammatical error, however, the popular opinion is that it is most likely to be an archaic form of grammar that Dawson preferred. All this work remained in place until Newark Parish Church was dissolved in 1988. The building has since been transformed into private flats. The other plaques depicting the boats were presented to the people of Port Glasgow, by the last Kirk Session of Newark Parish, in celebration of their connection with shipping andthe river, and they still hang to this day in Port Glasgow Town Hall. After enquiry and negotiation by our Minister, the Rev Morris Coull, the furniture was donated to Hillington Park and so it was installed in all its glory for everyone to see. Each piece still has a plate detailing the date of the re-dedication of Newark Parish Church, 10th April 1938, and also who gifted it to the church. The communion chair was gifted by one Moses MacGregor which makes our minister feel at home. I would recommend that you take some time to marvel at the work of Archibald Dawson, and to reflect that we are so blessed to have, sitting in our very own chancel area, these magnificent works of art. Since they arrived in Hillington Park, numerous students, visiting preachers, preachers, Interim Moderators and even elders have conducted services and delivered sermons to the membership of Hillington Park. 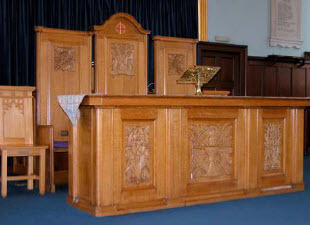 But I wonder how many actually realise the history of the chancel furniture they were preaching from. Our own minister John MacGregor commented that the carvings form an important feature of our centenary celebrations because in 1908 when our church was founded, Archibald Dawson would have been about 16 years old and already planning his works of art for the future. He died aged just 46 years on the 17th April 1938, one week after Newark Parish church was re-dedicated and one month before the Empire Exhibition was opened, but he lives on through his work. Who knows how many more works of art he would have sculpted had he lived longer.